Public transit may be the best option to avoid closures on the Turcot Interchange over the next five days. Here's a look at your options. Public transit may be the best option to avoid closures on the Turcot Interchange over the next five days. Starting tonight, crews will be working to dismantle a section of the old Highway 15, heading north, without damaging Highway 20 or the rail corridor underneath it. Transports Québec has advised commuters to work from home, avoid non-essential trips and use public transit during the closures. EXO is adding 14 additional trains during off-peak hours on the Vaudreuil-Hudson line. These trains will stop only at Dorval, Vendôme and Lucien-L'Allier stations. 200 parking spaces will be available at Les Jardins de Dorval shopping centre, near the Dorval station. 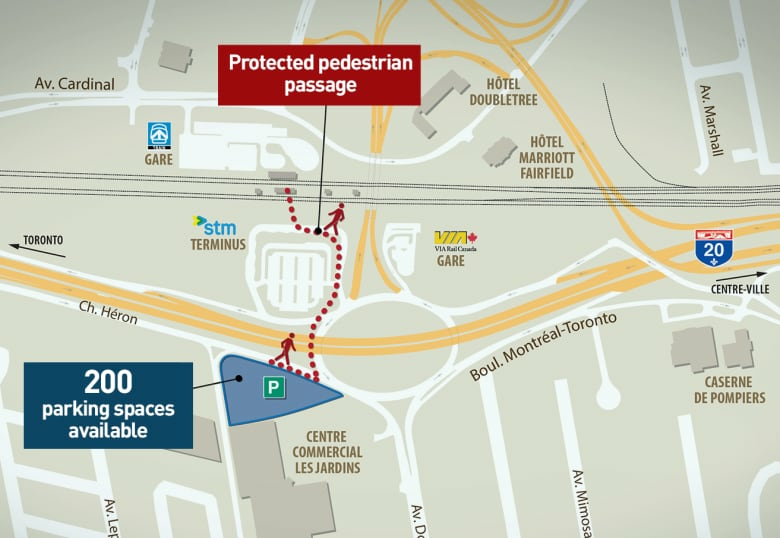 Access to the station is via a protected pedestrian route under Highway 20. For Friday and Monday, rides will be free on the Vaudreuil-Hudson and Candiac train lines. A free shuttle will be available at rush hour between the Châteauguay bus terminal and Sainte-Catherine station on the Candiac train line. Bus routes 1 and 28 will be diverted to Angrignon metro. These buses normally travel to the Mansfield terminus in Montreal. Free tickets for the metro will also be given to users of these lines. The STM is also warning that the following bus lines will be especially affected by the roadwork: 12, 21, 36, 37, 61, 107, 168, 178, 191, 211, 405, 411, 420, 425, 485, 491, 496, 747. The road closures are necessary to dismantle an above-ground section of the old Highway 15 that spans the new Highway 20 and Canadian National's main rail corridor. A tweet from the Turcot illustrates the expected congestion zone.